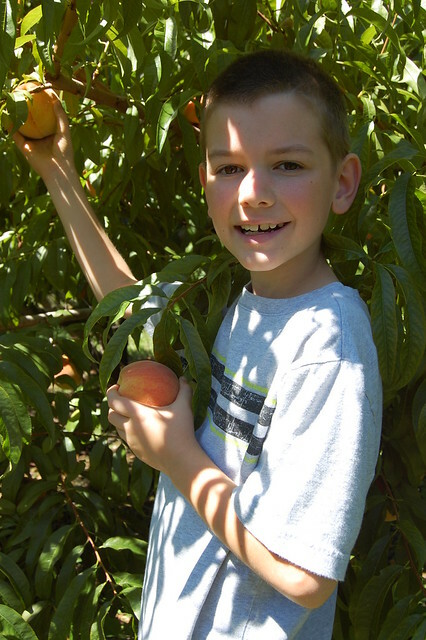 This weekend we decided to do something that none of us have done before: we picked peaches. Pick-Your-Own was a staple of my childhood. Scotland is renowned for its soft fruit growing so we would pick berries throughout the season, gorging on them until we swore we would never eat them again. Other times we would head to the farm to pick up vegetables or to root around and find free range chicken, duck and goose eggs – fingers crossed for a double yolker. Peaches, however, were not part of my landscape growing up*. There were apple orchards and pear trees, plums and apricots but no peaches. So peach picking was a new experience for us all. 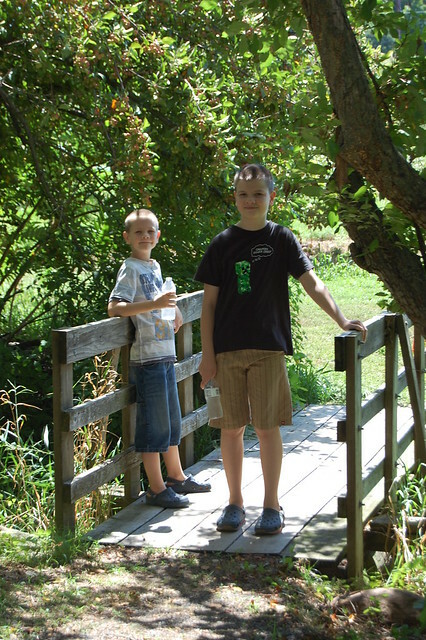 We headed out to a farm near Pennsylvania’s border with New Jersey. Once there, we collected some plastic bushels** and hopped on the trailer attached to a tractor to be taken out into the fields. We were assured that it was too far to walk but actually everything was within easy walking distance and we ended up walking back even though we were carrying full buckets by then. It was, therefore, possible to wander around and collect all manner of seasonal produce. 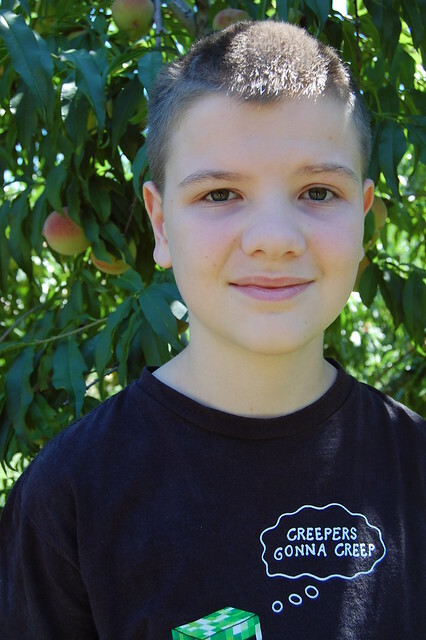 The kids and I are all huge devourers of peaches and Mr Pict is quite fond of them as ingredients in pies and cobblers so we devoted most of our time on the farm in the peach orchard. As an aside, thanks to my husband being a Civil War nerd, I can never not think of body strewn battlefields when I see the phrase “peach orchard”. Anyway, there were yellow peaches, white peaches and nectarines all ripe and available to be picked. Our preference is for juicy, fuzzy, fleshy yellow peaches so we wandered far down those rows and started picking. The fruit was abundant and easily plucked from the branches. We were looking for peaches that had a nice red bloom on them but were not so ripe that they would need to be eaten immediately. My 8 year old found some peaches were the silhouette of a leaf or of the curve of an adjacent peach had been caught on the red part of the skin which was quite interesting to see. 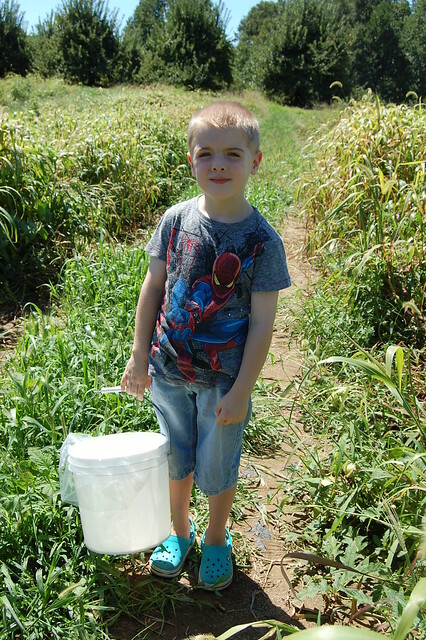 Having filled two bushels with peaches, we decided to head over to the vegetable patches. My personal aversion to aubergine means that my kids have little or no experience of eating those beyond their appearance in ratatouille. We, therefore, looked at two different varieties of aubergine (or eggplant as they are called in America), the regular bulbous ones and the longer Italian ones. 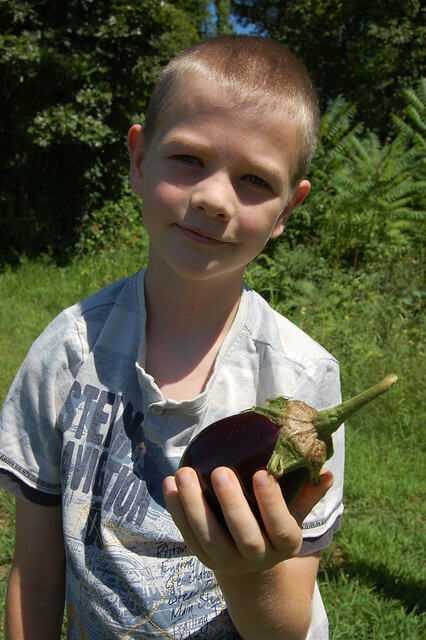 My 9 year old selected an almost spherical, deeply purple aubergine to try. 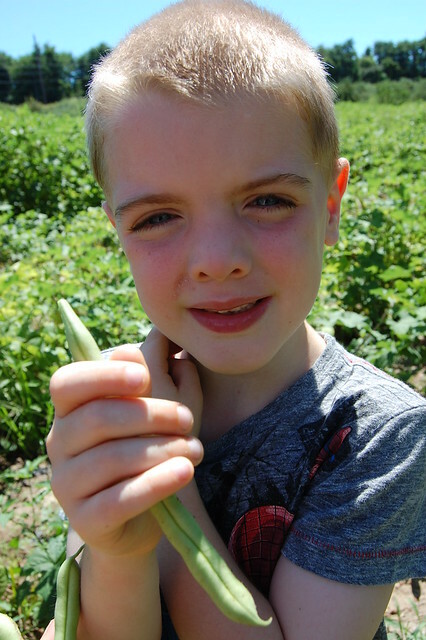 We then headed to the area where beans were grown and in no time at all we had filled an entire bucket with green beans and yellow wax beans. I tried in vain to find the okra and the boys were beginning to melt in the afternoon son so I had to give up that quest. 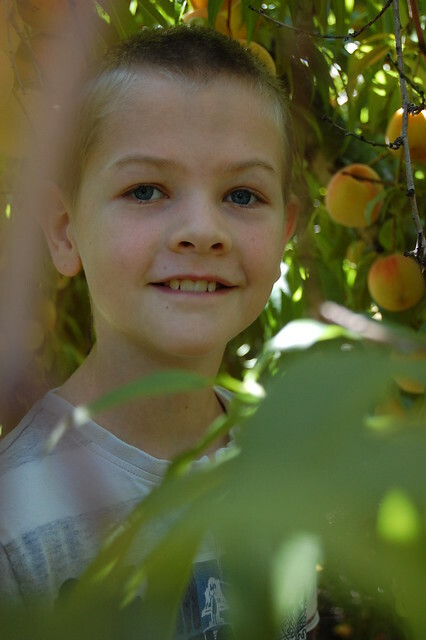 We all thoroughly enjoyed our first peach picking experience and it saved us so much money to buy the fruit and veg through pick-your-own that we definitely think we will return to that and other farms again to enjoy collecting more delicious seasonal produce. Now I need to go and make a peach cobbler. 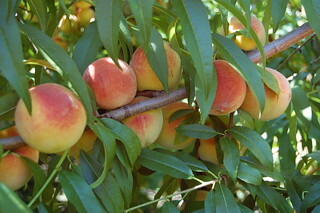 * I believe peach trees can be grown in the UK but I have personally never seen them. ** We collected our fruit in bushels but I couldn’t resist the alliteration of peck for the title. I loved hearing about your fruit-astic adventures. But I really liked the photos you managed to take. Might I ask what camera you use? Thank you very much for your lovely comment and the charming pun. My camera is actually getting pretty geriatric as DSLRs go. It’s a Nikon D40. I have always owned Nikons as I love their lenses. I’m, not quite as far south as it gets in the UK, but I’m close, and I don’t know anyone with a peach tree–at least outside a greenhouse. That makes me feel better about never having encountered one in the UK in all my years living and travelling there then. I had some vague hope of growing apricots and my gardener friends told me, basically, to forget it. I feel like I’ve definitely seen apricots growing in Britain but perhaps they are varieties only good to cook with, making chutneys or something. Or maybe I have false fruit memory syndrome. False fruit memory syndrome? Could be. I don’t know that it’s a question of variety, because the discussion never got that far. I was left with the impression that in the perfect, protected place it might work. Where I live? Nah. Salt wind, etc. So maybe in a walled garden somewhere, tucked snugly up against a south-facing wall. With a nice teddy bear to cuddle. Listen, don’t take my gardening comments too seriously. I really don’t know what I’m talking about. Me neither. I have brown thumbs. I can even kill cacti. BBC to the rescue. Gardeners are growing dwarf varieties for the patios and conservatories. I bet the kids had loads of fun and had a different kind of adventure. It was fun and we will definitely return to have more experiences of picking things for the first time. Stuff you’ve picked yourself always tastes the best!! Never picked peaches either but what a lovely day out. Thanks. I quite agree. I cooked the beans last night in curry spices and they were delicious.